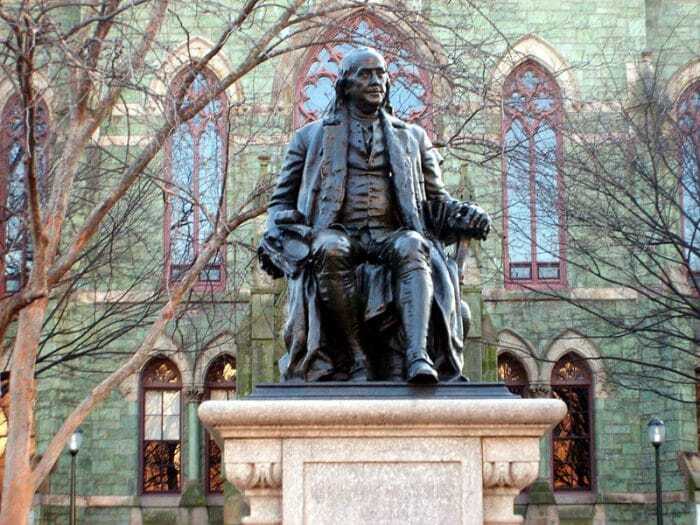 If Ben Franklin has any great-great-great grandkids applying to college these days, they should most certainly apply Early Decision to the University of Pennsylvania. The University of Pennsylvania has rendered its verdicts on the Class of 2023 and sent out decisions to all Regular Decision applicants. In total, between Early Decision and Regular Decision, 44,960 students applied for admission to UPenn in the hope of earning a slot in the incoming class. It marked the largest applicant pool in the school’s history. Of these students, 3,345 earned admission. And while mathematics is certainly not our strong suit, our fingers tell us this marks an admit rate of 7.44%, which happens to be a record-low for Ben Franklin’s institution of higher learning. For the Classes of 2022, 2021, and 2020, the admit rates were 8.4%, 9.2%, and 9.4%, respectively. Spot a trend? As our loyal readers know well, UPenn’s Dean of Admissions Eric Furda is a hero of our college admissions blog: he has a habit of telling it like it is and we love him for it. But we have a teeny-tiny, criticism: stop admitting so many legacies. Around a quarter of Early Decision admits should not be the progeny of folks who attended the school. We understand the benefits of admitting legacies. We’re not naive. Admitting legacy applicants helps foster a spirit of giving. Tuition dollars don’t cover the full cost of a student’s education — even a full-paying student. Low-income students and many of the first-generation college students that schools like UPenn covet rely on these donations — whether or not they know it — to subsidize the cost of their educations. But approximately one in four Early Decision admits (23% for the Class of 2023, 25% for the Class of 2022) and one in seven-and-a-half overall admits? Now that seems excessive to us. And is this a point that UPenn should really be bragging about in their press releases and such? It’s always strange for us to see the legacy figures juxtaposed in the same press releases with the socioeconomic and racial diversity figures of admitted students: figures that the school actually should be bragging about. But, hey, the Early Decision legacy figure dropped from 25% to 23% this year so maybe we should be starting a slow clap. Rudy, Rudy! If you’re a University of Pennsylvania alum or the progeny of a University of Pennsylvania alum who opposes our longtime stance on legacy admission and wants to tell us how legacy students are just as qualified as are non-legacies, feel free to send us hate hail. We look forward to hearing from you!